The October issue of I Like Crochet is here. Crocheting for fall is the best. Here are four NEW reasons why! Picking patterns and pumpkins! Time to crochet the Pumpkin Pal Bib! Spooky and Sweet, the Twilight Ghost Sweater is a treat! Velcome…the Frightfully Adorable Baby Bat Set! Last but not least, the Little Bear Costume is perfect for a baby’s first Halloween! Get ready to crochet some spook-tacular patterns! Take a cue from fall’s changing foliage and try one of these designs for the season. From cowls crocheted with brilliant variegated colorways to scarves and shawls that are the perfect accent to your autumn wardrobe, these patterns are must haves. Adore cuddling up with a latte? Or perhaps transitioning your home from bright summer tones to more neutral, autumnal tones? These five patterns range from slipper socks to a bobble pillow, and all remind us that fall is a time to relax, unwind and enjoy the crisp morning air. Make a grand entrance into fall with new designs inspired by autumn’s favorite flowers! A stunning afghan set will warm your sitting room while a trendy sweater will keep you toasty during a nature hike. Whether you crochet one of these patterns for yourself or for a friend, you won’t want to keep these new designs quiet! Love walks on cool, crisp days? Good, because winter is on the way and the days are going to get chillier! The solution to the cold is new designs to add to your closet. With several hats to choose from and a cardigan you’ll want to wear every day, these patterns will carry you well into the winter season. Subscribe today to get all of these patterns and more!!!! The color of the year is a happy and vibrant shade of green. We challenged our designers to create patterns that feature this happy hue in new and exciting ways. Fill your home with greenery accents for a fresh take on summer. Crochet like a master artist with these four inspired designs. Will you crochet Monet’s water lilies? Or will you pick up your hook and do a little Boogie Woogie? It’s up to you! Fall is around the corner and you’ll want to start preparing soon! With a bright and sunny color palette, these patterns will help ease you into the new season. Headed somewhere fun this summer? You’ll want to have at least one of these designs with you! Lightweight styles and afghans perfect for a car ride, these patterns are adventurous and exciting. Take a trip with your crochet when you begin one of these designs. It’s the middle of summer and crocheting in this weather can be quite the challenge! Five new patterns that you can wear on the hottest days of the year will inspire you to pick up your hook and crochet the summer days away. Trend alert: Geodes! From home décor to jewelry, geodes are seemingly everywhere. These two patterns are crochet interpretations of this marvelous trend. Subscribe now so you can get starting on these patterns today! I just came across another crochet design of mine that I had nearly forgotten about. Here is my Holiday Ornaments Ripple Afghan that I designed for Herrschners using their 2-ply afghan yarn. This was designed as part of their Ripple of the Month series and they are now making it available as a kit, probably just for a limited time. First of all, I hope everyone is having a great Memorial Day weekend! I’ve been spending my weekend dodging rain showers and trying to get some photographs in of some of my designs. Today I am happy to share with everyone a never before seen or published design I call the Sands of Time Rippleghan. 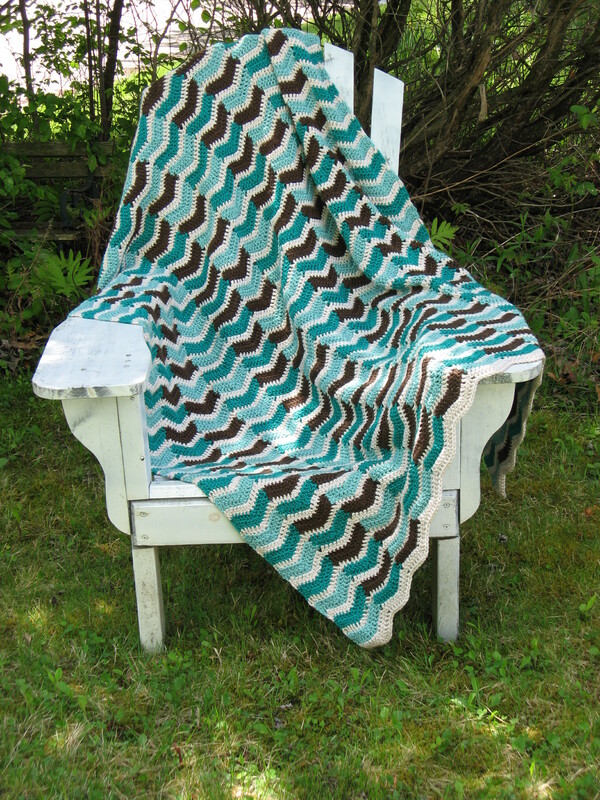 I wanted to design an afghan using what was, at the time, the Pantone color of the year– emerald green. I didn’t want the emerald to be too dominant in the design though, because it was showing up everywhere. 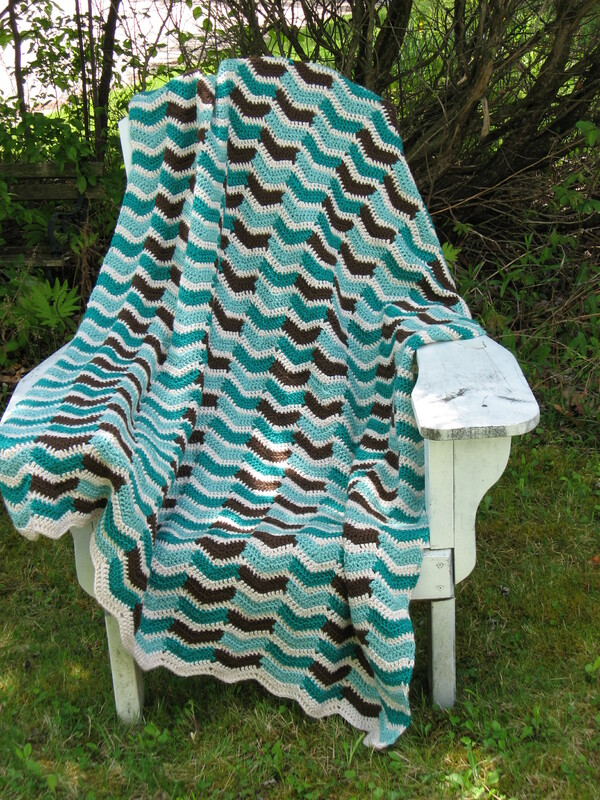 The afghan is not as difficult to make as it may look– the trick is actually just in the color changes. 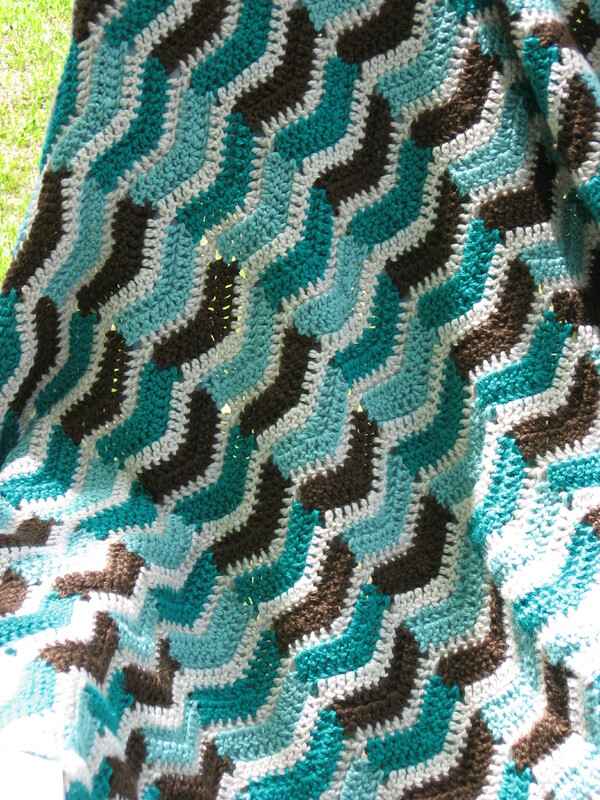 This afghan pattern is being offered for sale on Ravelry and Amazon. I hope you like it!